The provisions of this chapter apply to grading, excavation and earthwork construction, including fills and embankments. Where conflicts occur between the technical requirements of this chapter and the geotechnical report, the geotechnical report shall govern. Unless the applicant has submitted an engineering analysis, prepared in accordance with standard engineering practice by a registered design professional, that demonstrates the proposed work will not result in any increase in the level of the base flood, grading, excavation and earthwork construction, including fills and embankments, shall not be permitted in floodways that are in flood hazard areas established in Section 1612.3 or in flood hazard areas where design flood elevations are specified but floodways have not been designated. J102.1 Definitions. The following words and terms shall, for the purposes of this appendix, have the meanings shown herein. Refer to Chapter 2 of this code for general definitions. BENCH. A relatively level step excavated into earth material on which fill is to be placed. COMPACTION. The densification of a fill by mechanical means. DOWN DRAIN. A device for collecting water from a swale or ditch located on or above a slope, and safely delivering it to an approved drainage facility. EROSION. The wearing away of the ground surface as a result of the movement of wind, water or ice. EXCAVATION. The removal of earth material by artificial means, also referred to as a cut. FILL. Deposition of earth materials by artificial means. GRADE. The vertical location of the ground surface. GRADE, EXISTING. The grade prior to grading. GRADE, FINISHED. The grade of the site at the conclusion of all grading efforts. GRADING. An excavation or fill or combination thereof. KEY. A compacted fill placed in a trench excavated in earth material beneath the toe of a slope. SLOPE. An inclined surface, the inclination of which is expressed as a ratio of horizontal distance to vertical distance. TERRACE. A relatively level step constructed in the face of a graded slope for drainage and maintenance purposes. Except as exempted in Section J103.2, no grading shall be performed without first having obtained a permit therefor from the building official. A grading permit does not include the construction of retaining walls or other structures. 1.Grading in an isolated, self-contained area, provided there is no danger to the public and that such grading will not adversely affect adjoining properties. 2.Excavation for construction of a structure permitted under this code. 4.Refuse disposal sites controlled by other regulations. 5.Excavations for wells, or trenches for utilities. 6.Mining, quarrying, excavating, processing or stockpiling rock, sand, gravel, aggregate or clay controlled by other regulations, provided such operations do not affect the lateral support of, or significantly increase stresses in, soil on adjoining properties. 7.Exploratory excavations performed under the direction of a registered design professional. Exemption from the permit requirements of this appendix shall not be deemed to grant authorization for any work to be done in any manner in violation of the provisions of this code or any other laws or ordinances of this jurisdiction. In addition to the provisions of Section 105.3, the applicant shall state the estimated quantities of excavation and fill. In addition to the provisions of Section 107, a grading plan shall show the existing grade and finished grade in contour intervals of sufficient clarity to indicate the nature and extent of the work and show in detail that it complies with the requirements of this code. The plans shall show the existing grade on adjoining properties in sufficient detail to identify how grade changes will conform to the requirements of this code. 1.The nature and distribution of existing soils. 2.Conclusions and recommendations for grading procedures. 3.Soil design criteria for any structures or embankments required to accomplish the proposed grading. 4.Where necessary, slope stability studies, and recommendations and conclusions regarding site geology. Exception: A geotechnical report is not required where the building official determines that the nature of the work applied for is such that a report is not necessary. For sites with mapped maximum considered earthquake spectral response accelerations at short periods (Ss) greater than 0.5g as determined by Section 1613, a study of the liquefaction potential of the site shall be provided and the recommendations incorporated in the plans. Exception: A liquefaction study is not required where the building official determines from established local data that the liquefaction potential is low. Inspections shall be governed by Section 110 of this code. The special inspection requirements of Section 1705.6 shall apply to work performed under a grading permit where required by the building official. The slope of cut surfaces shall be no steeper than is safe for the intended use, and shall be not more than one unit vertical in two units horizontal (50-percent slope) unless the owner or the owner’s authorized agent furnishes a geotechnical report justifying a steeper slope. 1.1.It is not intended to support structures or surcharges. 1.2.It is adequately protected against erosion. 1.3.It is no more than 8 feet (2438 mm) in height. 1.4.It is approved by the building code official. 1.5.Ground water is not encountered. 2.A cut surface in bedrock shall be permitted to be at a slope of one unit horizontal to one unit vertical (100-percent slope). Unless otherwise recommended in the geo-technical report, fills shall comply with the provisions of this section. The ground surface shall be prepared to receive fill by removing vegetation, topsoil and other unsuitable materials, and scarifying the ground to provide a bond with the fill material. 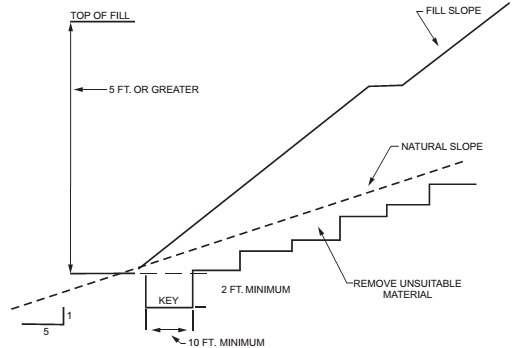 Where existing grade is at a slope steeper than one unit vertical in five units horizontal (20-percent slope) and the depth of the fill exceeds 5 feet (1524 mm) benching shall be provided in accordance with Figure J107.3. A key shall be provided that is at least 10 feet (3048 mm) in width and 2 feet (610 mm) in depth. Fill material shall not include organic, frozen or other deleterious materials. No rock or similar irreducible material greater than 12 inches (305 mm) in any dimension shall be included in fills. All fill material shall be compacted to 90 percent of maximum density as determined by ASTM D1557, Modified Proctor, in lifts not exceeding 12 inches (305 mm) in depth. The slope of fill surfaces shall be no steeper than is safe for the intended use. Fill slopes steeper than one unit vertical in two units horizontal (50-percent slope) shall be justified by a geotechnical report or engineering data. Cut and fill slopes shall be set back from the property lines in accordance with this section. Setback dimensions shall be measured perpendicular to the property line and shall be as shown in Figure J108.1, unless substantiating data is submitted justifying reduced setbacks. 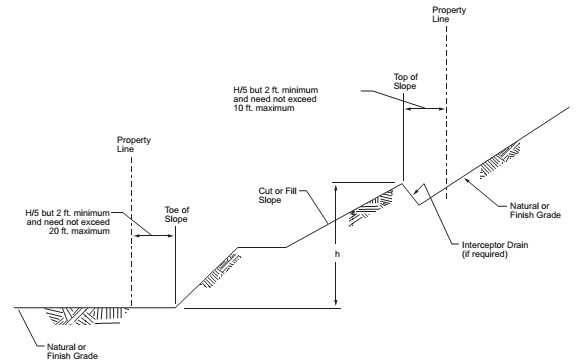 The setback at the top of a cut slope shall be not less than that shown in Figure J108.1, or than is required to accommodate any required interceptor drains, whichever is greater. 1.Setbacks greater than those required by Figure J108.1. 2.Provisions for retaining walls or similar construction. 3.Erosion protection of the fill slopes. 4.Provision for the control of surface waters. Unless otherwise recommended by a registered design professional, drainage facilities and terracing shall be provided in accordance with the requirements of this section. Exception: Drainage facilities and terracing need not be provided where the ground slope is not steeper than one unit vertical in three units horizontal (33-percent slope). Terraces at least 6 feet (1829 mm) in width shall be established at not more than 30-foot (9144 mm) vertical intervals on all cut or fill slopes to control surface drainage and debris. Suitable access shall be provided to allow for cleaning and maintenance. Where more than two terraces are required, one terrace, located at approximately mid-height, shall be at least 12 feet (3658 mm) in width. Swales or ditches shall be provided on terraces. They shall have a minimum gradient of one unit vertical in 20 units horizontal (5-percent slope) and shall be paved with concrete not less than 3 inches (76 mm) in thickness, or with other materials suitable to the application. They shall have a depth not less than 12 inches (305 mm) and a width not less than 5 feet (1524 mm). A single run of swale or ditch shall not collect runoff from a tributary area exceeding 13,500 square feet (1256 m2) (projected) without discharging into a down drain. Interceptor drains shall be installed along the top of cut slopes receiving drainage from a tributary width greater than 40 feet (12 192 mm), measured horizontally. They shall have a minimum depth of 1 foot (305 mm) and a minimum width of 3 feet (915 mm). The slope shall be approved by the building official, but shall be not less than one unit vertical in 50 units horizontal (2-percent slope). The drain shall be paved with concrete not less than 3 inches (76 mm) in thickness, or by other materials suitable to the application. Discharge from the drain shall be accomplished in a manner to prevent erosion and shall be approved by the building official. J109.4 Drainage across property lines. Drainage across property lines shall not exceed that which existed prior to grading. Excess or concentrated drainage shall be contained on site or directed to an approved drainage facility. Erosion of the ground in the area of discharge shall be prevented by installation of nonerosive down drains or other devices. The faces of cut and fill slopes shall be prepared and maintained to control erosion. This control shall be permitted to consist of effective planting. Exception: Erosion control measures need not be provided on cut slopes not subject to erosion due to the erosion-resistant character of the materials. Erosion control for the slopes shall be installed as soon as practicable and prior to calling for final inspection. Where necessary, check dams, cribbing, riprap or other devices or methods shall be employed to control erosion and provide safety.